The sun is warming the brick wall, the lawn is still green and lush, (prior to the inevitable next six months of abuse from the dogs), and the hornbeams have a distinct blush of green on their twisted limbs. The evenings are cold, but I insist on sitting out here after work with a cup of tea and a thick jumper, staring at what I have. 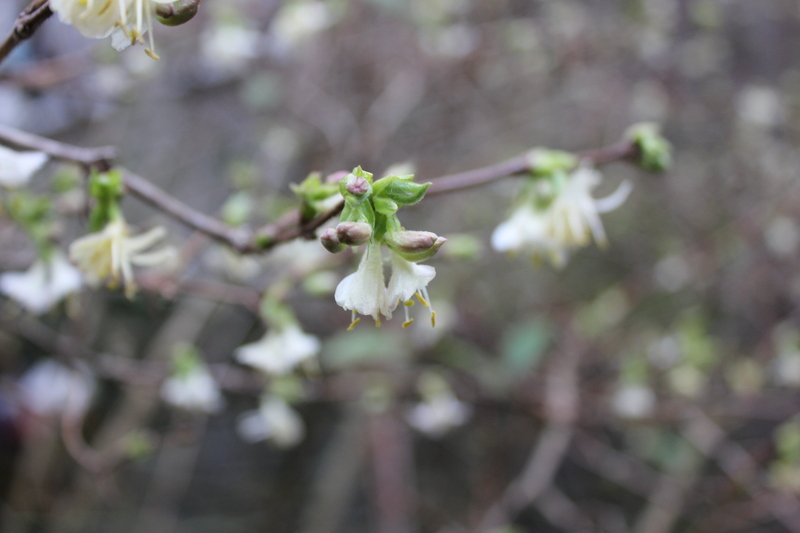 Here, outside the French doors, there is a winter honeysuckle, Lonicera Fragrantissima, given to us by Mum twelve years ago, under which I sit and survey the scene. I have sat here in this chair for years, my favourite place in the garden, and over those years the Lonicera has grown and grown, becoming a sheltering canopy over my head. Later in the year its leaves are almost dense enough to shelter me from summer rain, but now, at the beginning of the year it is at its most delicate, a mass of tiny flowers hovering over me and sweetening the air.